Plans submitted for what could become Manchester’s tallest building. The planning application by CQ Investments was being co-ordinated by Deloitte Real Estate. 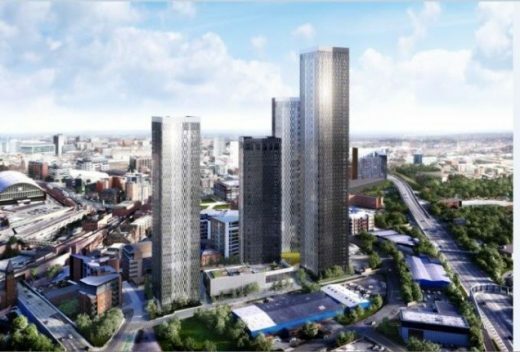 Renaker lodged a planning application (11 April 2016) for four residential towers of between 38 and 64 storeys to the South of Manchester city centre, providing more than 1,400 flats. The towers on the site of the Owen Street car park in Castlefield are expected to reach at least 37, 44, 50, and 62 storeys each. The apartments will be supported by a three-storey amenity building, which will include facilities for residents such as an indoor tennis court, swimming pool and spa, gymnasium, studios, cinema screen, rooftop café bar with terrace and private garden, entertaining and home office and business facilities. There will also be 95,000 sqft of public realm around the River Medlock, with the largest space equalling the size of Exchange Square in Manchester city centre. There will be three levels of basement parking with around 700 spaces. CQ Investments, the Renaker subsidiary bringing forward the project, said that it intended to start construction in the third quarter of 2016 with a build period for the scheme anticipated to span four-and-a-half years, with the entire scheme operational in 2020. Activity has already begun to clear the car park ready for a start on site. The design by SimpsonHaugh & Partners echoes a project that this architecture practice designed for West Properties for the same site, which was approved in 2008. 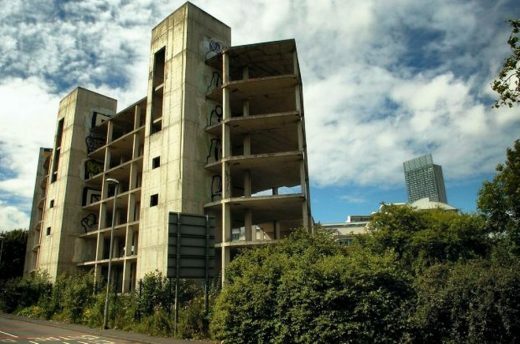 Renaker purchased the site from Morgan Stanley in 2015, after it was put on the market in a sell-off of former West assets in Manchester city centre. The planner is Deloitte Real Estate. Location: site bordered by Great Jackson Street to the south and west, and Deansgate to the north, central Manchester, England, UK (right next to the architects’ own offices). This development includes four residential towers, from 38 to 64 storeys. It is planned to be part of a 1.5ha site called Great Jackson Street and will feature over 1,400 one, two and three-bed apartments across the four buildings. The 64 storey tower which would create the second tallest building in the UK – just nine floors lower than the 309m (1013ft) Shard in London, excluding the spire of the latter building. A planning application for a high quality residential led scheme on the Owen Street site in central Manchester is due to be submitted to Manchester City Council by CQ Investments Limited, part of the Renaker Build group of companies, in February 2016. The scheme adheres to the principles of Manchester City Council’s adopted Development Framework for the Great Jackson Street area, according to Manchester Confidential. If planning permission for the scheme is granted by the City Council, CQ Investments intends to start construction immediately in the third quarter of 2016 with a build period for the entire scheme anticipated to span four-and-a-half years with the entire scheme operational in 2020. Location: River Street, site bordered by Garwood Street and the Mancunian Way, central Manchester, England, UK. 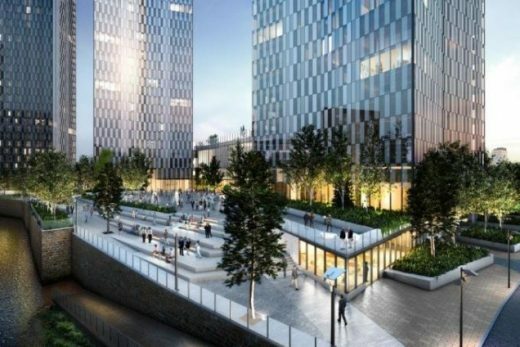 Plans have been submitted for a 42-storey glazed tower, a new landmark next to the Mancunian Way, reports The Manchester Evening News. At its 410ft highest point, it will be five floors lower than the 554 ft tall Beetham Tower, containing the Hilton Hotel – Ian Simpson’s most famous building. The slender tower on River Street will create up to 600 serviced apartments aimed at short-stay professionals visiting the city for business. It will also be almost ten storeys higher than the city’s next tallest building, the 33-storey, 109 m-high Student Castle complex, off Oxford Road, which is due for completion this year. 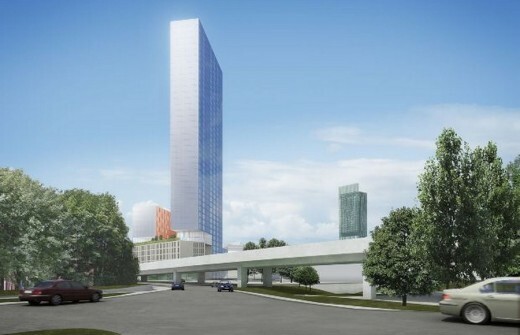 The two skyscrapers, which have a strikingly similar cantilevered design, will be located less than half a mile apart. The River Street scheme plot has been occupied for around ten years by an unfinished concrete frame. It sits beside the city’s ring road. The developers, Chelmer Developments, acquired the site in April 2011. They are working with hotel management experts, Hamilton Hotel Partners. The lower floors would house a lobby area, cafeteria, gym, retail and office facilities. There will be a small number of parking spots underground. 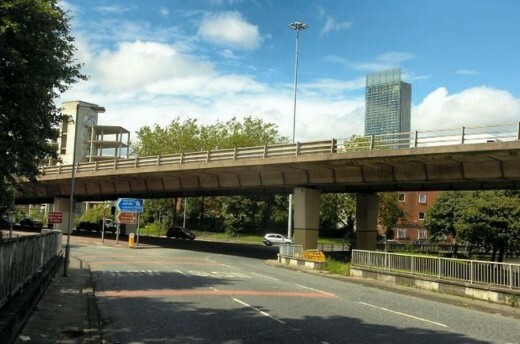 A pedestrian link connects the site to Hulme underneath the Mancunian Way. The landmark building is close to First Street where a new cultural quarter has been designed by the practice and £19m arts centre for the city. The £150m Beetham Tower became Europe’s tallest residential building when it was completed in 2006. It is now the 9th tallest building in the UK. The new Simpson tower would be the 23rd tallest building in the country. Manchester is the fastest growing city in Britain.